DONG NAI (VNS) — Many farmers harvesting maize in Lang Minh Commune, Xuan Loc District, Dong Nai Province say they are happy with a new strain of genetically modified (GM) maize. They claim it helped them save production costs by using less pesticides and herbicides. Nguyen Lam, a farmer with 40 years' experience in growing maize, told Viet Nam News that he had set aside 2,000 square metres of his total 24,000sq.m maize farm to try out a new variety supplied by Dekalb Viet Nam. "The new strain yielded as much as the hybrid maize we are using now, which is estimated at 11-12 tonnes per hectare, but it cost less to produce," he said. Lam calculated that for each hectare of maize he could save VND3 million (US$250) using the new variety because he had to spray herbicides only once instead of two or three times. He also saved on the cost of hiring workers to do spraying. Lam also saved all the money he would normally spend on pesticides because the new strain is resistant to three major types of kinds of pests - leaf worm (Spodoptera litura), corn borer (Ostrinia nubilalis) and corn earworm (Heliothis armigera). The new corn was supplied on trial to three farming households in Xuan Loc District. Company representatives also conducted field schools to instruct up to 300 farmers on growing techniques. They came not only from Dong Nai, but also from neighboring Tay Ninh, Binh Thuan, Binh Duong and Long An provinces. The company has also provided GM maize seeds for more than 100 farmers throughout Viet Nam to try. 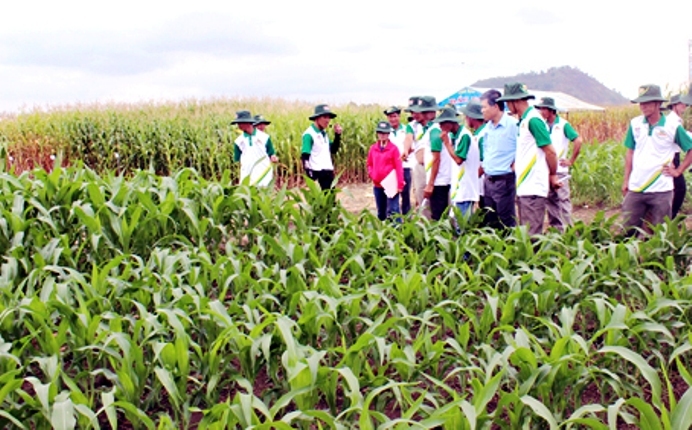 Pham Dong Quang, vice-director of the Cultivation Department under the Ministry of Agriculture and Rural Development, said he pinned high hope on the GM maize. He also claimed that use of the new crop could also boost national maize production. Last year, although the country harvested 5.6 million tonnes of maize from a total acreage of 1.2 million hectares, it had to import another 4.8 million tonnes.